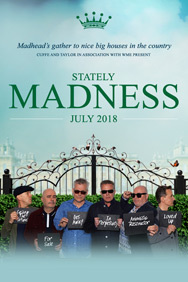 Music fans will get the chance to go One Step Beyond this summer as Madness announce an exclusive four-date tour of UK stately homes and a castle! The British pop icons, who have been thrilling audiences for almost four decades, will headline four open air gigs bringing their House of Fun to: July 6 - Englefield House, Reading July 7 - Euston Park, Thetford July 13 - Ragley Hall, Alcester July 14 - Alnwick Castle, Northumberland. The last couple of years have been truly sensational for Madness as they followed up a phenomenal 2016 appearance on Glastonbury’s Pyramid stage with the release of their 11th studio album – the critically acclaimed Can't Touch Us Now. Featuring the hit single Mr Apples, it instantly went Top 5. Daniel “Woody” Woodgate and Mark "Bedders" Bedford have played to millions of fans over the last 40 years. Formed in Camden in 1976, they have chalked up 15 UK Top 10 singles– including the timeless Our House, It Must Be Love, One Step Beyond, My Girl, Wings Of A Dove and Baggy Trousers – together with seven Top 10 albums. Known for their cheeky humour and musical eclecticism, this “dysfunctional family" create a unique sound that comes into its own on stage and continues to endear them to fans new and old.